Pizzas without a tomato sauce are commonly referred to ‘Pizza Blanco’ in Italy. They are more like an artisan pizza with thin crust and infused with flavors from herbs. Doesn't that sound delicious? And who doesn't like to make one of these pizzas at home when you can get a flavor similar to that. I made the Pizza Blanco for lunch on Sunday while I was trying to decorate the cake that I posted earlier. Now you can guess why my frosting went wrong. Multi-tasking while cake decoration is not a good idea :). Anyways, the pizza was rich in flavors and it was really delicious. My family loved it very much. I just threw some asparagus and shallots as topping and they turned out to be a yummy combination. 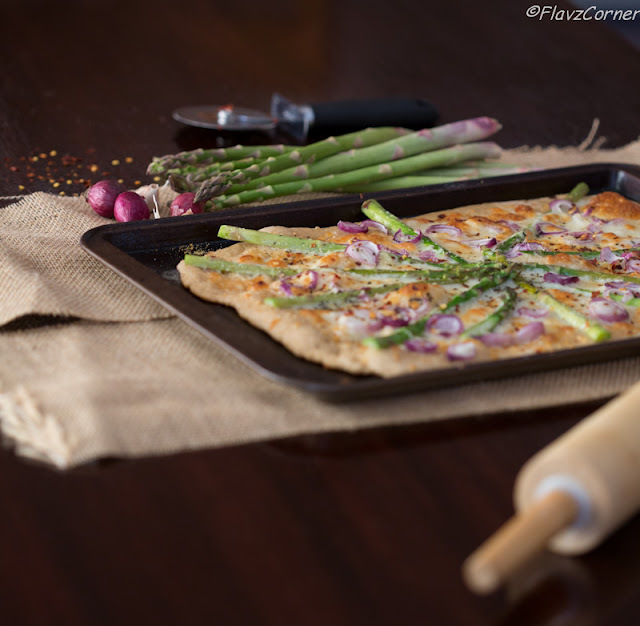 The flavors of the pizza are attained by brushing the crust with olive oil that is infused with herbs and garlic. You can use any topping of your choice. Knead the wheat flour, yeast mix, salt and 1 cup of water to form a elastic dough. The dough might stick a little bit, but its OK. Add 1 tsp of olive oil to coat the top of the dough. Cover and leave it to rise for 1 hr. Pre heat oven to 410 degree F.
Wash and pat dry the asparagus. Remove the bottom hard part of the asparagus and cut them into halves lengthwise. 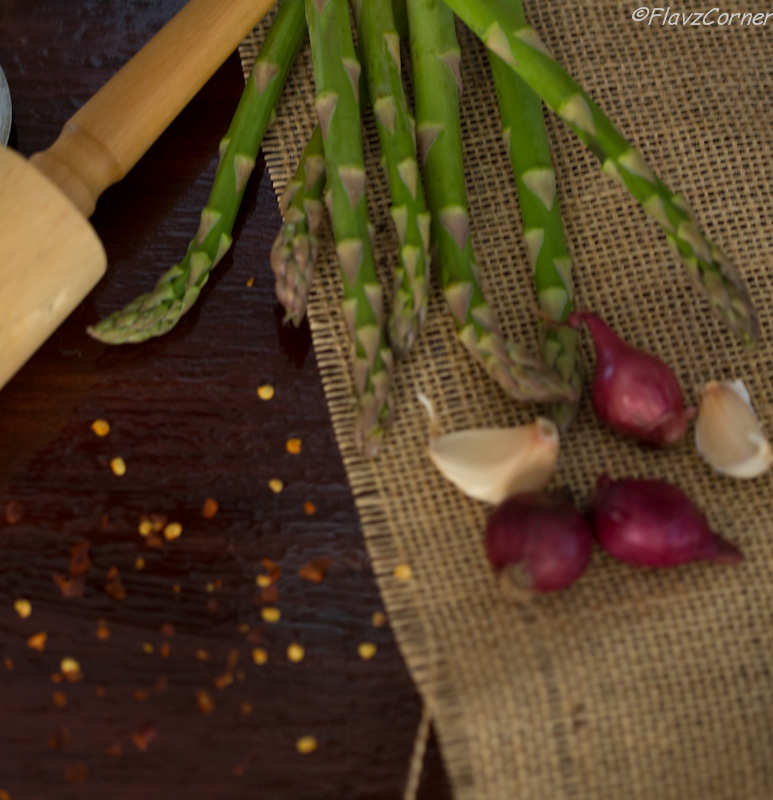 Add the asparagus, sliced shallots, grated garlic, red chili flakes and 1 tbsp of olive oil to a bowl. Toss them gently to coat well without breaking the asparagus and separating the shallot slices. In a small bowl mix together 2 tbsp of olive oil, grated garlic and chili flakes for brushing. Dust the pizza pan with wheat flour. Punch down the air from the pizza dough and divide the dough into 2 balls. Roll the dough ball on a floured surface into a thin crust. I rolled the dough into a rectangle shape. Place the rolled sheet on the pizza or baking pan and use your fingers to spread it more if the corners don't have a good shape. Brush the garlic basil oil on the rolled dough and sprinkle kosher salt. Add 1 1/4 cup of shredded Mozzarella cheese on the rolled dough. 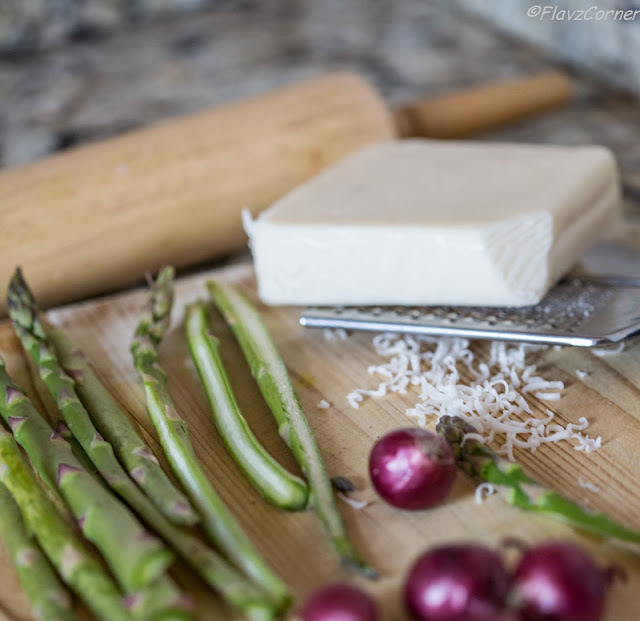 Arrange half of the asparagus Shallot mix on top of the cheese. Sprinkle 1/4 cup of Parmesan cheese above it. Bake for 12 - 15 minutes till the side gets light golden brown. Make the second pizza with the rest of the dough and toppings. Enjoy them while they are warm. You can add more herbs like oregano, rosemary and even use pepper to add more flavors to the brushing oil. Great looking pizza! And such a nice combo of flavors. 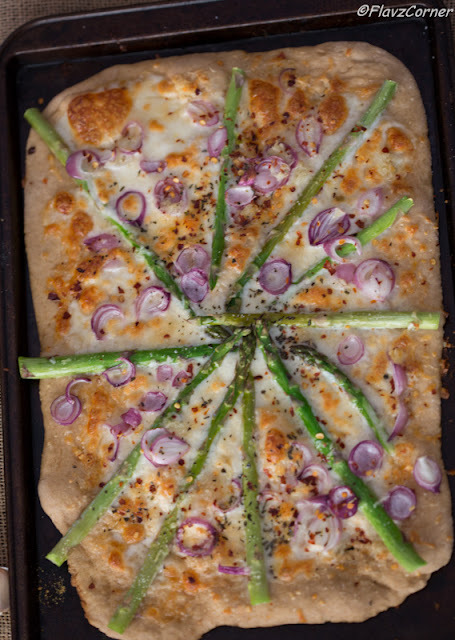 Fun way to use asparagus. I definitely don't multitask when I'm decorating something - it takes all of my concentration just to make a mess of what I'm decorating (I don't really have the decorating gene). Although I'd certainly be tempted to, if that meant I'd get to eat this pizza quicker! ;-) Good stuff - thanks.